The datasheet of new Sony IMX455AQR full frame sensor now leaked online. According to our source, the upcoming Nikon D6 could use this sensor, which means Nikon D6 will be the first 8K DSLR camera to be announced in early 2019. 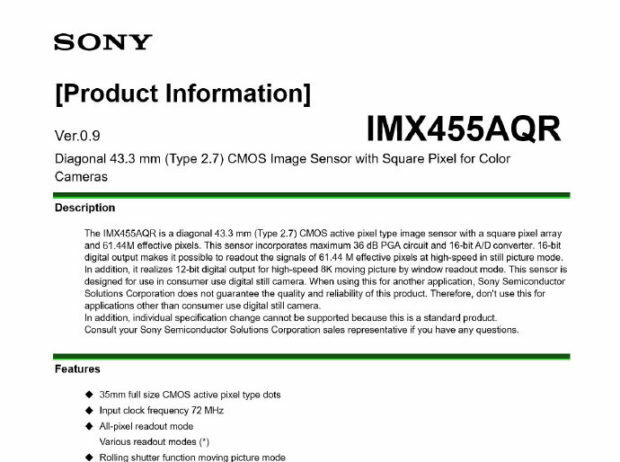 The IMX455 sensor has 60MP, 8K Video, and native ISO at 64. Get instantly notified by e-mail when Nikon D6 is Available for Pre-order ! Nikon COOLPIX A1000 and COOLPIX B600 Announced ! How can the low light pictures be good with such a high resolution? The D5 did not prove itself a worthy camera for sports photography due to limited dynamic range. I hope the D6 will improve on this. Did I read this right, 60MP sensor? If so, this is bad news for sports photographers who shoot a lot pics to get one. Previous Previous post: Hot One Day Deal – Sigma 18-35mm f/1.8 DC HSM Art Lens for $549 at B&H Photo Video ! Samyang/Rokinon AF 85mm f/1.4 F Lens for Nikon F-mount now Available for Pre-order for $699 ! Mitakon Zhongyi Speedmaster 50mm f/0.95 Mark III Lens for Nikon Z Mount Announced, Price $799 !